It’s mid week and I’ve had a very strange day, well not entirely but a couple of weird things happened. I think the appropriate term for them is ‘Senior Moments’! I was running a bit late this morning and rushed out of the house only to realised that I had locked myself out and my house and car keys were still inside. It was raining and cold. Still never mind, I thought, T is home, still in bed, and he spoke to me just before I left so he’s not in deep sleep, I just need to wake him up. It was almost an hour before he finally came down stairs in a daze and asked me what I was doing on the door-step. In all that time I had been banging on the door and phoning the house phone constantly. Fortunately the porch is covered so I was able to keep out of the rain and I had a cat for company most of the time. So I was late for work, not a good start to the day! The day at work went OK and I managed to get all my work done. My job means that I just sit at a computer all day long so at lunch time I always try and get out for a walk. As I was putting my coat on at lunchtime one of my colleagues told me I was mad as it was pouring with rain, but I said ‘It’s only water and besides I need to stretch my legs”. By the time I got to the door the sun had come out and I had an enjoyable break. This evening after work we went to get the weekly shopping, on the way we had to pick up Mum and Dad as they wanted to shop too, and also collect a parcel from the depot (because it wouldn’t fit through the letterbox). We got to the store, parked the car and then I realised I didn’t have my handbag. So while they went in and did the shopping I drove home again and collected my bag which I had left in the kitchen. The image above is number 7 of 8 illustrations I did for Dr Amy Johnson‘s new book Being Human. Due out in November. The page is reproduced here with Amy’s permission. 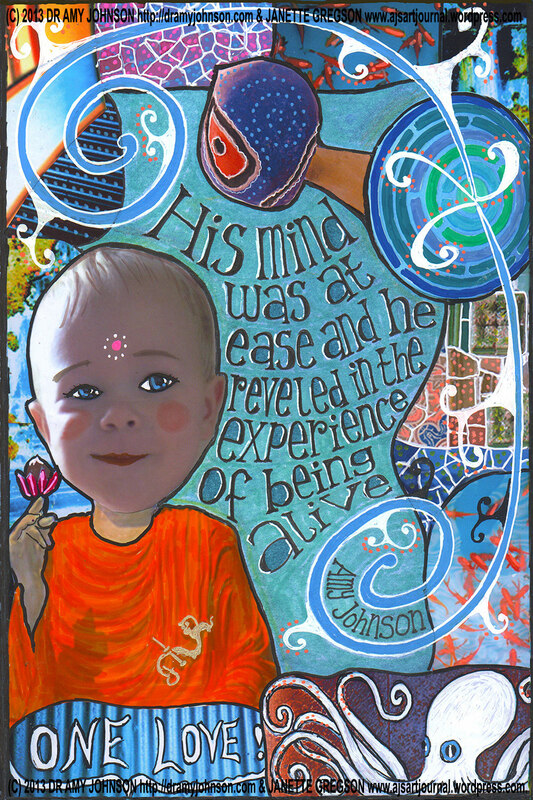 It features Miller, Amy’s son, from a photograph Amy sent me, the collage elements are mainly my own photographs and the Buddha body is from an image that is in the public domain. Then everything was altered with various pens. I hope you have a great week and I’ll see you soon. This entry was posted in Being Human and tagged AJ, AJ art journal, art journal, Being Human, collage, Doodles, Dr Amy Johnson by ajsartjournal. Bookmark the permalink. Don’t feel bad, we all have those days! Take care!